Queen Margrethe has delivered her 37th New Year message from Amalienborg Palace and bid Danes to remember to give thanks for their privileged position and suggested Denmark shouldn't let go of its international responsibilities. A smile and a thanks to fellow human beings will help carry Danes safe and sound through the financial crisis. The Queen said Danes can say thanks for what they get, even if they have a right to it, to accept with grace and 'thanks' will help all through the difficult times. The Queen reminded Danes of their assets: "Diligence and good spirit, common sense together with friendliness." In spite of the financial crisis, the fear of higher unemployment and colder winds in the next year, Denmark is still a rish and safe society. This carries obligations, she said. "For a very long time we have got used to everything getting better and better with every day being brighter. Now things are painted with darker colours. But let us look up anyway and put our worries into comparison with a greater perspective. In other places human beings have problems of a completely different kind to fight. There is hunger and disease, distress and war. Measured against this scale Denmark is very much positioned among the world's most privileged nations. 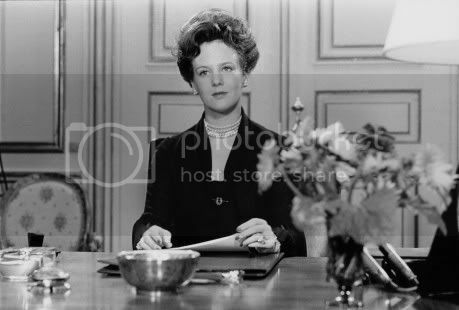 That brings obligations," said Queen Margrethe. "For more than half a century Denmark has been greatly engaged in many international concerns and has given considerable assistance to development work in many places in the world. But especially in a period of economic depression, there is a need for Denmark to continue to actively share international responsibility," the Queen stated. The Queen looks forward to the UN's climate conference in Copenhagen next autumn in which Denmark has to try to "change environmental problems into new prospects". And then she thanked a number of public employees - schoolteachers, home carers, nurses and police officers - for their effort for all of society: "In our society we deeply depend on each other and on those groups of people who cause day-to-day life to hang together," the Queen said. The Queen mentioned Joachim's and Marie's wedding, the Greenlanders' decision about moving towards autonomy and said she will be in Greenland for the national day to confirm there's "still a close and intimate cooperation between Denmark and Greenland". On the personal level the Queen used the opportunity to tell of her pleasure in celebrating Prince Joachim's and Princess Marie's wedding and thanked the people for supporting Joachim and his new bride. The Queen's thoughts are also for soldiers in Iraq and Afghanistan and their relatives, who have a huge task, especially in Afghanistan, where in some cases they have given their life. This year Queen Margrethe delivered her 37th New Year speech which was broadcast on New Year's Eve at 6pm by both DR1 and TV2. Danish monarchs have delivered New Year speeches since the 1880's. The first to be transmitted on radio, by Margrethe's grandfather, Christian X, was in 1941. The speeches were broadcast on radio from 1941 until 1957 when television broadcast of the speeches began in 1958. B.T. 'Eksperter: Dronningen så god som Obama' - Experts: like Obama Queen Margrethe has hit spot with this year's New Year speech. Hurrah for Margrethe. The experts agree. 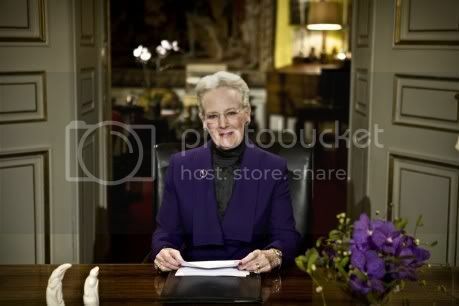 Queen Margrethe's New Year speech hit the nail on the head yesterday evening. The Queen, who is normally interested in spiritual things, has simply hit on the spirit of the times, thinks sociologist and lifestyle expert, Emilia Van Hauen. She thinks the Queen sounds like a Danish version of the future American president Barack Obama - because she talked both about everyday issues for Danes in 2008 and at the same time looks to the future. It's a future in which the financial crisis, globalisation and a threatened environment force us to see the world with a greater perspective. "It's a fantastic speech...She encouraged Danes to complain less and remember the really poor. She spoke about the coming climate conference and about the service of the day-to-day heroes, teachers, nurses and police. She also spoke about the war's heroes - in Iraq and Afghanistan... The fantastic thing about the Queen's New Year speeches is how well they are harmonise with Danish reality. It's the secret behind the Danish royal house's popularity. "She is in step with the times. And that is reflected in the the speech," author and historian Jon Bloch Skipper says. You can hear various speeches by Christian X via DR's Bonanza site (scroll down). You can also see a video clip of Christian X riding through the streets of Copenhagen on horseback and by car (with Queen Alexandrine) receiving 70th and 71st birthday wishes. You can not only see Christian X, but Crown Prince Frederik (later Frederik IX), Queen Alexandrine, Crown Princess Ingrid, Princess Margrethe, Prince Knud, Princess Elisabeth, Princess Caroline Mathilde and Prince Ingolf.